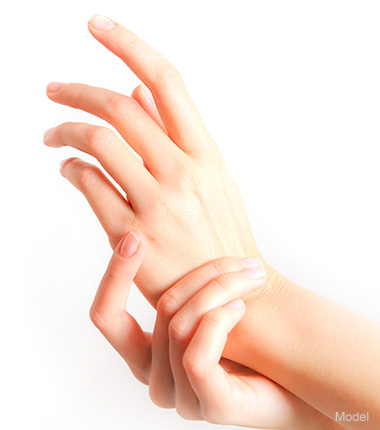 Carpal tunnel syndrome is a commonly seen problem due to pressure on the main sensory and motor nerve to the thumb and adjacent index long and half the ring finger. Tingling in these digits and weakness in the thumb are the result of the nerve being deprived of blood flow over the course of time. Usually the changes are gradual and can be made worse with pregnancy or repetitive wrist activity. The condition is sometimes associated with arthritis, fluid retention or injury. In some individuals symptoms can be managed by splinting and anti-inflammatory medication. However, if no improvement is seen within 6 weeks, consideration should be given to surgery. Especially severe is the finding of wasting or loss of muscle in the thumb and adjacent soft tissues. The test done to prove the existence of nerve compression is often done to confirm the diagnosis. In the operation, your surgeon will make an incision from the middle of the palm to the wrist. He will then cut the ligament that runs across the nerve and tendons in the wrist tunnel. The nerve is fully released and then the tissue overlying the carpal tunnel is repaired but with the ligament left open to heal by filling the opening with repair tissue or scar. The need for follow-up and physiotherapy is important to ensure that this repair tissue forms properly over the ensuing 6 weeks. Recurrence is rare if this is carried out along with proper use of splints by the occupational and physiotherapists. Pain is likely to be controlled with oral analgesics and hand elevation in the first 48 hours and then with anti-inflammatory medication subsequently. Rehabilitation is usually continued by the patient at home starting during the second through sixth week, following which, strengthening may still be required for an additional month or so, depending on the occupation of the patient. The second side can be released any time after the sixth week. -Please shower or bathe that morning. -Wear comfortable clothing/shoes that can be easily removed and put on such as pullovers, hoodies and pull on pants. -The first 2-3 days post surgery is the most difficult. Relax. Rest. You will need help with day-to-day household activities (cooking, cleaning). If it hurts, you should not do it. Avoid bending and lifting. If you have had surgery that day don’t dangle the hand below your waist for 24 H, sleep with your hand slightly elevated. A travel pillow works well. -Take your prescribed pain medication. Do not combine alcohol with your pain medication. However, if you develop excess pain, swelling or bleeding, go to the nearest hospital emergency department. -There may be some discomfort and oozing from the site. This is normal. Keep the dressing dry and intact until you are instructed to remove it or Physio takes it off one week post op -Vigorous physical activity (jogging, bending and lifting) should be avoided for a minimum of 2 weeks after surgery. Limit exposure to high heat or sun. Follow up is usually within 7-10 days post op. You should call the office at 204 231 1542 for your appointment time. If Dr. Dolynchuk deems Physiotherapy necessary they will contact you after surgery on or around day 5. All surgery and medical procedures carry some degree of risks and/or complications. It is important that you understand that complications are a part of the post surgical process. The majority of our patients do not experience any complications. However, a small minority may. We do our very best to avoid any complications but if they do occur we do our best to treat them as soon as possible. Bleeding/Hematoma- It is possible, though unusual to have a bleeding episode after surgery. Should it occur, apply pressure for 3 minutes and go the hospital emergency department. A hematoma appears as a lump and is painful. It has to be drained, go the hospital emergency department. Infection- Infection in the surgical sites is possible. If there is redness, pain swelling, foul smelling pus/discharge or you have an oral temperature over 100.4 degrees Fahrenheit contact the office. Antibiotics or additional surgery may be necessary. Scars- All surgical procedures produce a scar. Scars range from almost an invisible line to a thick ropey one. We cannot predict who will form unsightly scars. Scars initially may be a bright red color and then tend to fade over time. Change in Skin Sensation- Sometimes an area may experience numbness or tingling. This may be temporary but it can also be permanent. Delayed Healing- Wound separating or delayed wound healing is possible. It can depend on many factors such as: quality of skin, general health and dressing care. There can be skin loss and further surgery to remove the non-healed tissue. Smoking- After your surgery it is important not to smoke (minimum 6 weeks) so the tissues heal properly. Smoking has been shown to increase post surgical complications and delay healing. Pain- There may be some additional discomfort caused by swelling and bandages. We want you to be as comfortable as possible after surgery. Use Tylenol only for pain in the first 24 hours, then Advil for pain may be used after this. Allergic Reactions- In rare cases patients may experience local allergies to tape, sutures or topical preparations. Please inform us prior to surgery if you have any allergies (ex. Latex, Aloe Vera, etc.). Patients may also experience allergies from anaesthetics (ex. lidocaine) and topical antibiotics like Polysporin®.